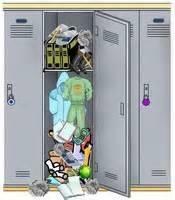 It’s that time of year again – time to clean out the lockers before exams! All lockers are to be emptied by the end of day on Tuesday, June 19th, and the locks are to be returned to the homeroom teachers. Any lockers not emptied by this time will be emptied by the school custodial staff. Any locks not returned will result in a $10 fee charged to the student, so make sure your teachers know you passed it in! Teachers are also in the process of collecting textbooks. Books that are not returned to the school will have to be replaced, and students are responsible for the replacement costs. To see how much you will need to pay to replace a textbook, please consult this list. Ms. Power has also been in the process of collecting the outstanding library books, and students who do not return their library books will also be charged $10 per missing book. Please contact Ms. Power for more information.